I bought a new GPS the other day a Garmin GPSMAP 62st that I thought I’d do a quick review and highlighting some stuff that will be useful to me. I’m not going to do a deep down review on the GPS, you can find those already on the web and YouTube. The newly designed GPSMAP 62st handheld navigatorfeatures a 3-axis tilt-compensated compass, a barometric altimeter, preloaded TOPO 100K maps and supports custom maps, BirdsEye™ Satellite imagery (subscription required) and photo navigation. 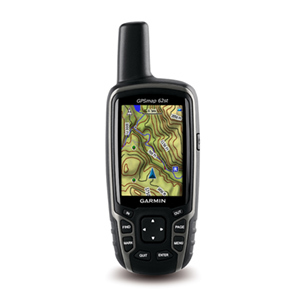 Rugged and waterproof, GPSMAP 62st employs a quad helix antenna for unparalleled reception, has a high-speed USB connection, a sleek new design and connects wirelessly to compatible Garmin handhelds. This little device is quite nice actually. I’ve only handled road GPS’ before and a Foretrex or two and this is a whole nother level! If you’re lazy or just want the Google Earth look on your maps you can subscribe to BirdsEye so you can download high res photos of your area of interest. I’ve tried the demo version and it is good! I think I’ll get that too because it’s only about 20USD for a year and every “photo” you download you “own” as long as you don’t delete it. Pretty smart! Some other nice features in the GPS is that almost every page/view is customizable so that you can change what info you want to show. You can also have different views depending on what Profile you’re using at the moment e.g. Geocaching, Recreational etc. On thing that I would like to have the ability to change is how fast it jumps to the next page when pressing the “Page” button. Now you have to wait for some time before it changes page or you have to press “Enter” to go there instantly. But requiring satellites is super fast and the accuracy is great that’s what counts in the end. You also get Geocaching capabilities via Garmins own knock off site http://www.opencaching.com/ but also via the original Geocaching.com. The Geocaching mode in the GPS is nice and clean and if you have a Premium account at geocaching.com you get all the info you’d get from your phone with their application such as hints, logs etc. 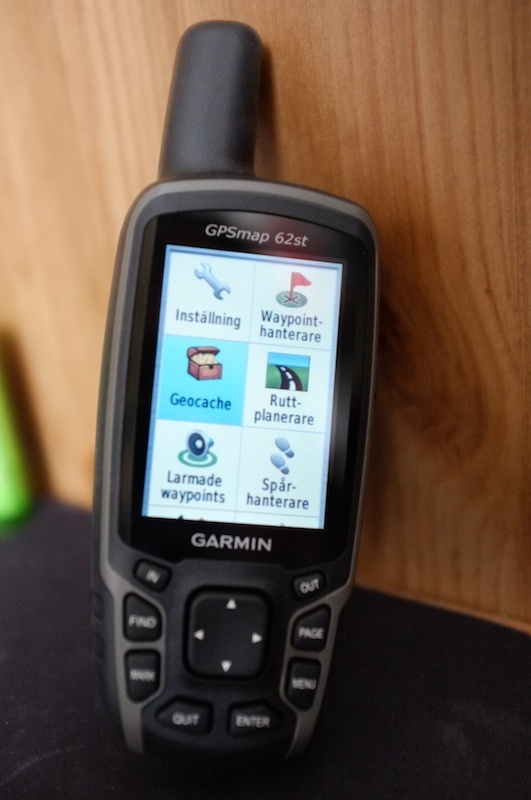 I do have some problems with the function “Send to GPS” so I have to download the .gpx file and drop it into Basecamp (Garmin app) or directly into the built-in memory of the GPS itself. 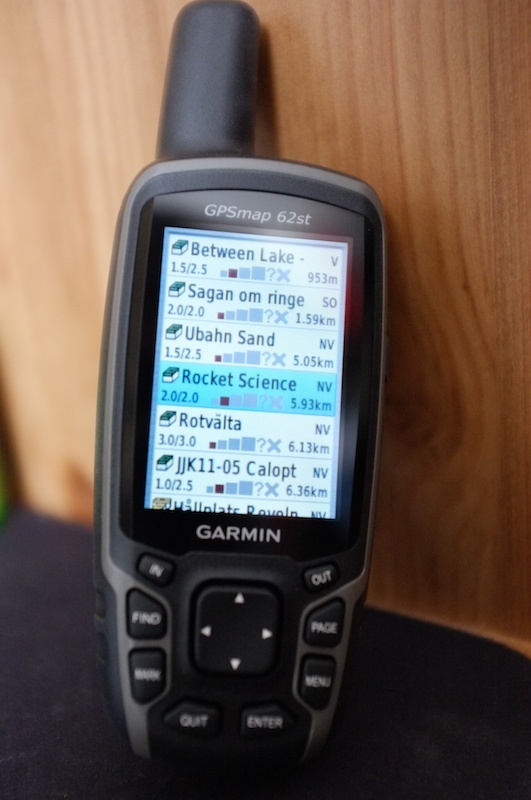 I fixed the problem with “Send to GPS” and it was just to download a new Beta version of the Garmin Connect software. This is a really nice GPS if you can afford it because it’s a little pricey but it’s most definitely worth every penny! This entry was posted in Gear and tagged garmin, gpsmap, gpsmap 62st, handheld by André - LighterPacks.com. Bookmark the permalink.